The Ngong tunnel on the Nairobi to Naivasha standard gauge railway (file photo). Ten months after the launch of Kenya's cargo service on the standard gauge railway line between Mombasa and Nairobi, it has turned out to be a double-edged sword. In its first nine months, the service earned Kenya Railways more than $16 million, prompting the operator to double the haulage capacity using double-stack wagons to the Nairobi Inland Container Depot (ICD). Already, the trains' daily tonnage has increased to over 800 containers, out of the 1,700 that arrive at the port of Mombasa. The ramping up of the operations has also seen the line ease the government's payments of the loan to China. 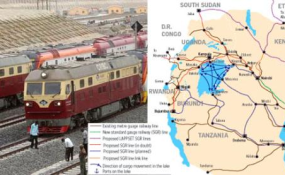 "Since the start of SGR cargo freight operations in January, $16.2 million has been billed, collected and remitted to the SGR escrow account, which is under the custody of Kenya Railways," said Kenya Ports Authority managing director Daniel Manduku. The launch of the double-stack wagons, which Kenya Railways says will double the cargo capacity hauled to Nairobi from Mombasa, comes as the Nairobi ICD struggles with congestion. It has since acquired more land as it seeks to expand its capacity. The Kenya International Freight and Warehousing Association (Kifwa) says the depot is stretched, holding more than 8,000 twenty-foot equivalent units (TEUs) against its capacity of 3,000 TEUs. "We are seeing more cargo being hauled to the Nairobi ICD, and coupled with the slow clearing process, it is becoming congested," said Kifwa national chairman William Ojonyo. Mr Manduku said KPA has leased four storage facilities in Nairobi "to address cargo pile-up at the ICD, which we expect to help clear our yard capacity." He said that a joint monitoring centre has been set up for realtime tracking of containers from Mombasa and throughout the value chain, which has drastically minimised delays. But, even as Kenya Railways and the government celebrate the success of the freight service, businesses in Mombasa that depend on the port economy have started reeling from losses, as the faster, seemingly more efficient SGR cargo train takes over cargo evacuation. Truckers, container freight stations (CFSs), and clearing agents continue to count losses, with some logistics companies reported to have resorted to restructuring that has seen thousands of job losses. Omar Bakari, 56, a long-time truck driver on the Northern Corridor, told The EastAfrican in Mombasa that currently, business is bad. The EastAfrican caught up with Mr Bakari as he prepared to transport mitumba (bales of used clothes) from the Mombasa port to Kampala -- cargo classified as high-risk due to the possibility of being diverted to the Kenyan market. "This is my first trip this month and I am grateful," he said. "Before the SGR cargo train, I would do three trips in a month and take a week off, but now we spend more time waiting for the goods than on the road. We have seen a reduction in port-related business as a result of the SGR cargo service. My employer still gets some business, but I know of companies that are struggling." The cargo train handles about 40 per cent of the port cargo transport business, taking away thousands of jobs. "I have been driving trucks for the past 21 years. I don't know how long I will last in this job," Mr Bakari said. As you drive from Nairobi to Mombasa, the effects of the SGR cargo service are evident in the scarcity of long haul trucks on the road and on the roadside. From Mlolongo -- an outcrop town that got its name from the tens of trucks parked on the road shoulders -- to Salama, a town 100km east of Nairobi, and a popular rest haven for long distance drivers, all the way to Mtito Andei, the Nairobi-Mombasa highway is deserted. But about 50km heading into Mombasa at Mariakani, the situation changes, with hundreds of empty trucks lining the roadside. Steve Kitili, 34, who runs a CFS in Mombasa, saw good business for the past six years, earning a promotion mid last year to become a manager. But not for long. The CFS closed in June, and the owner shifted base to Nairobi. "I am now depending on my wife's income and it is not easy," Mr Kitili said. With the government keen on transporting about 250,000 containers by train by the end of the year, there will certainly be more job losses in the port-related economy. Truckers are projected to incur $210 million in lost business. For the CFSs, the loss is estimated at more than $100 million, at the end of the year. As at June this year, the Container Freight Station Association (CFSA) said that more than 3,200 workers had lost their jobs. "We have let go more than half our workers as businesses struggle. All these job losses have happened here at the Mombasa port as a result of the reduction in trucked cargo volumes," said CFSA Chief Executive Daniel Nzeki. The Kenya Truckers Association also says several trucking firms have laid off hundreds of drivers and Transport Cabinet Secretary James Macharia says that in the eight months of the SGR cargo service operations, the government estimates that 1,300 trucks have been edged off the road, with the number bound to rise with the introduction of the double-stack trains and improvements in the holding capacity of the Nairobi ICD. "Once the entire stretch of the SGR line to western Kenya is built, we should see more than 2,600 drivers out of employment," KTA administrator Mercy Irei said. Early this month, Bollore Logistics, one of the region's largest freight and logistic firms sent workers home. "We shall consequently embark on restructuring the company into a leaner, more focused and customer-centric organisation by combining teams, reducing layers and stopping non-core or non-profitable activities. Regrettably, through this process, some of our colleagues will exit the company," Bollore Kenya Managing Director Jean-Pascal Naud said.